Moving fast with the ultimate driving machine to discover the best ways to connect to your car. To support its BMW Connected car platform, the company needed a clear vision for its mobile experience and needed it fast. We wanted to give drivers a seamless experience from the car, to a device, at work and in the home. And we wanted to introduce a customer-centric, agile design processes within the BMW organization while kickstarting a new innovation team. We developed the foundation for a connect-to-anywhere app that became the heart of the BMW Connected platform and was presented at CES and became the heart of the BMW Connected platform. We led two consecutive four-and-a-half-week explorations developing prototypes for the BMW Connected Drive experience. We started with consumer research that resulted in a set of user profiles and journey maps. BMW customers described three core customer values—connection, control, and confidence. We explored different Look & Feels based upon existing styles used for BMW external marketing and current BMW in-car user-interface designs. The Manifest and BMW teams worked to eliminate features, reduce complexity and refine the use cases for features that remained. We designed a simple primary tab-navigation experience with flexible secondary features that was used for prototypes and ended up becoming the foundation for the Connected Car experience. The BMW + Manifest team visited two dealers over the course of 4 weeks using a "guerilla testing" methodology.. We conducted five sessions rather than the 4 expected. 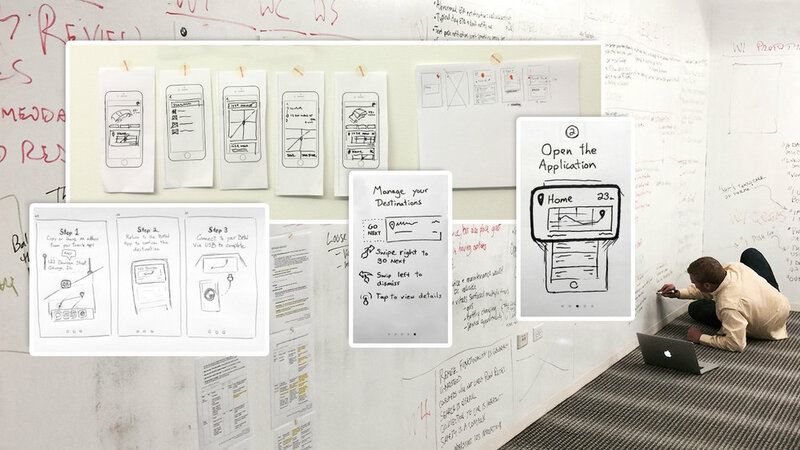 We ended up creating a best-practice guide for all BMW mobile apps, a best-practice guide for an agile process structure and a 3-year roadmap prioritizing product development. And BMW impressed CES crowds and media with a harmonious, connect-to-anywhere app that became the heart of the BMW Connected platform.